Available with or without propellers! 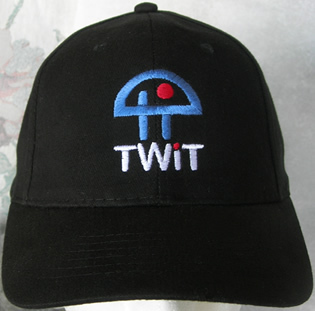 We know you've been itching to get some get TWiT gear... so have we, and we decided to do something about it! 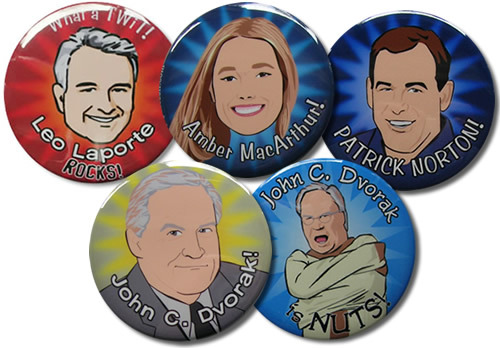 We've joined forces with Leo Laporte and the gang, and used our mighty geek resources to produce some of the coolest TWiT products yet. Introducing our exclusive TWiT embroidered beanies! A hip and stylish high-quality black beanie with the official TWiT design embroidered on the front. And on the back, the delectable "this WEEK in TECH" and the TWiT url. These beanies are GORGEOUS, and available with or without a propeller! You can choose up to three props to grace the top of your TWiT beanie, turning it into a formidable weapon of mass TWiT promotion! Yes, it's true! TWiT style meets legendary Geek Culture quality, and you can only get them here! The beanie is our best... black, 100% cotton, with white stripe around the knitted rim, and nice adjustable strap and buckle so it fits any TWiT's head. To put it simply... these beanies rock! And bonus! We're also including one of our awesome TWiT buttons FREE with every beanie! That's right, you can proudly wear your cap and your very own miniature Leo, Patrick, John C. Dvorak, Dvorak in a straitjacket, or Amber! Or pick up the complete collection of the five buttons for only $5.50 extra! Even better, two dollars of your purchase price goes directly to Leo and the TWiTs to help keep them bringing us the most loved and most-listened-to podcast! We are sold out of headwear! You can still get the buttons though! here. You've seen them on TWiT, you've seen them everywhere... get your own! and by sure to check out our entire collection of incredible headwear! The Sexiest propeller cap on the planet!